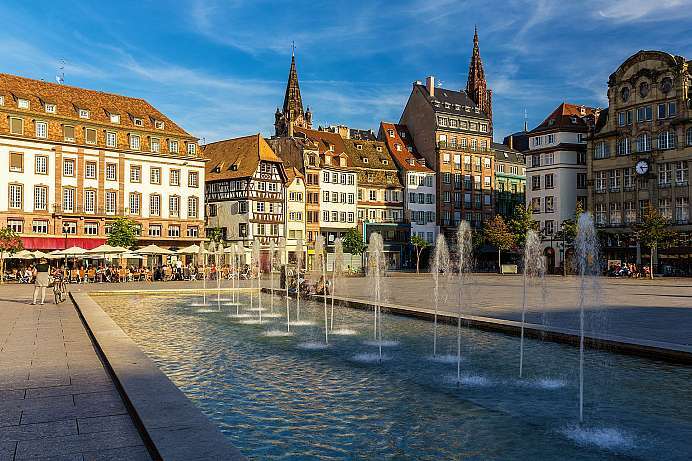 The capital of Alsace (Elsaß) on the western bank of the Upper Rhine is located at the meeting place of two cultures and is not the seat of the European Parliament only by chance. The Roman settlement quickly developed into an important trading center and was one of the most splendid cities of the German Empire in the Middle Ages. Mystics and humanists lived here as did reformers and first-class artisans. Johannes Gutenberg developed his first printing press in the shadow of the cathedral. Goethe and Herder studied at the University. 1681 the city was occupied by Louis XIV and remained French until 1871 (Franco-German War). After the 1st World War, the city fell back to France. The historic center on the Grande Isle consists of picturesque half-timbered houses from the 16th and 17th centuries. The impressive cathedral, one of the most significant monuments of Western architecture, towers at its center. The entire old town has been declared a UNESCO World Heritage Site. The Roman Catholic Cathedral of Strasbourg is one of the most important buildings in Europe, with both German and French influences. 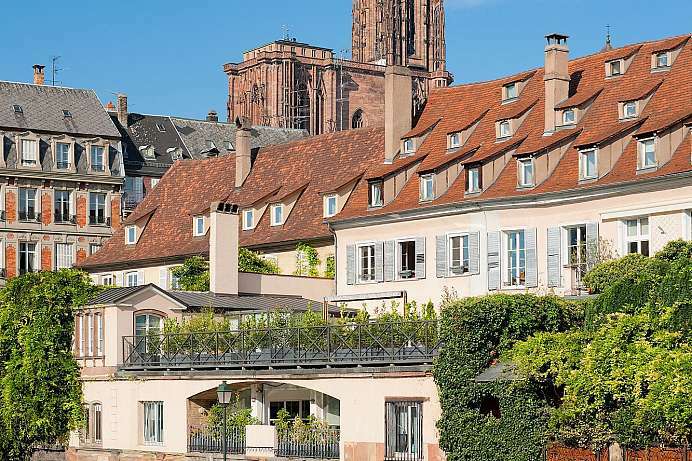 It was built from pink sandstone from the Vosges. Construction began in 1176 according to a Romanesque plan and was completed in 1439 in Gothic style. With just one tower, which was the highest in the world until 1874, the cathedral looks peculiarly asymmetrical. Noteworthy is the interior with its grandiose windows. Above the portals are two women who symbolize the Church and the Synagogue. The Church triumphs with the cross, while the Synagogue is blindfolded, because she is blind to Christ. However, the cunning artist has created the humble synagogue far more beautiful than the imperious Church. Anyone who wants to discover the old town, should best start at the Ancienne Douane, the magnificent old customs duty house. From there it is just a short walk to the Cathedral where, next to the cathedral, one finds the Maison Kammerzell. This richly decorated timber-framed building now houses a restaurant. After walking through the Rue des Hallebardes one crosses the Place Gutenberg to reach the former Tanners Petite France district with its old quaint half-timbered houses. Via the Ponts Couverts (covered bridges) one then arrives at the Vauban Dam with its panoramic viewing terrace.